We regret we’ve been remiss in reporting our wonderful journey into the world of hedgehog art history. The good news is we’re working on a children’s book that should be something delightful and quirky assuming everything works out well. We’ve discovered quite a number of works since the book was published. In case you’ve forgotten to buy the book, you can find it here. Well worth buying. And if you already have a copy, you’ll find a second copy incredibly useful as you can read it in stereo. While the book covered the period from the Renaissance forward, here we present works from the prehistoric to the Modern era. We’re so excited to share these, we’ll skip a wordy introduction and present our first picture with words under it. We begin with a truly thrilling discovery. Further archaeological research of the El Castillo cave paintings discovered in Cantabria, Spain, has discovered this, the earliest hedgehog art yet discovered. The work, from c. 39,000 BCE, used stencils and ochre to create this simple but charming and historic painting. This is a doubly exciting find. First we present a recent discovery of an ancient papyrus (apparently inadvertently misplaced by E. A. Wallis Budge in a nook in the British Museum) presents a fascinating view of what scholars believe is a hedgehog goddess judging the souls of the deceased. Equally fascinating is that the transliteration of the hedgehog goddess’ name in Egyptian is ‘eid-zil-la’ – it appears that we have discovered the most ancient reference yet know in art history to Hedgezilla! Here we present a truly remarkable Assyrian bas relief of the Assyrian Hedgehog warrior goddess, Kwillamash, aiding soldiers in a siege. This piece is a detail from the North Palace at Nineveh belonging to Ashurbanipal (668-631 B.C.E.). This piece was only recently discovered in 1985, though was lost in Mosul in 2003, and is now only preserved in photos. 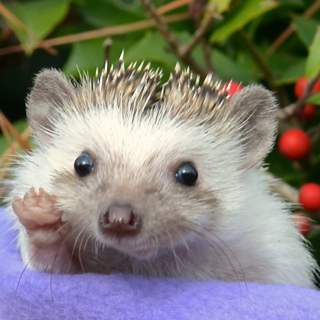 It’s believed that Kwillamash was represented by a hedgehog due to their legendary ferocity and deadly quills. This Greek red figure vase from the early 5th c. presents many mysteries to the hedgehog art historian. It’s possible that the figures depict the tale of Aleterix answering the riddle of the Sphinx (in an unusual Lydian hedgehog form), or alternately this might a tale of Croesis where the figures were replaced with hedgehogs, or one of several dozen other accounts because hedgehog art historians with time on their hands can fill in blanks is all sorts of ways. Regardless, so far as as ancient hedgehog art goes, this is a wondrous masterpiece worthy of a long discussion we will spare you, dear reader, out of the kindness of our hearts. Here we present a charming Medieval manuscript depicting a hedgehog battling an owl. 15th c., from the Hatton Manuscript. This margin drawing depicts a hedgehog armed with sword and shield fighting an owl. Monks of the era must surely have known about the owl’s cruel habits and enjoyed drawing the underdog getting the upper hand. Sacred Hedgehog of Mary, Stained Glass, Cathedral of Trier (1430s). This is a very… odd work. Originally commissioned for the cathedral by Otto von Ziegenhain, Bishop of Trier. At the time due to an outbreak of lead poisoning there was a dire shortage of stained glass artists. A mysterious artisan named Egelkopf appeared and offered his assistance. While he was quite skilled in glasswork, he was quite poor at following instructions, and oddly obsessed with hedgehogs. While Bishop Ziegenhain was displeased at the results, and the piece created some controversy, it was eventually accepted. At some point later the phrase “NESCIMUS QUID SIT ERICIUS IN FENESTRA” (we don’t know why there’s a hedgehog there) was inscribed below so people would stop asking. Egelkopf has been found listed in the mysterious manuscript from the 1500s, “Annales sermonum sublimis inter homines circa erinacei” (Annals of acts of greatness by humans to hedgehogs), a document deserving greater scholarly attention. Recently discovered, Da Vinci’s L’Ultima Cena Ma Con Ricci (The Last Supper, But With Hedgehogs) is difficult to explain, but clearly means something, and something big. We’ve spent many long hours examining this work and seeking the secret meanings, and believe we’re onto something very, very big. We’ve reached out to Da Vinci Code author Dan Brown about the many new layers of mysterious and conspiratorial meaning this adds to everything, though so far he hasn’t been very polite. One Da Vinci isn’t really enough, so here we share this, a likely second. Vitruvian Hedgehog (c. 1490). Experts remain unsure whether the work is an original by Da Vinci, or a student’s sketch, but we think those experts are just afraid to admit the truth partially revealed in The Last Supper, But With Hedgehogs which prove this is also a Da Vinci. Regardless of origin, or experts being picky about things, the work illustrates the perfection of proportions, and remarkable mathematical harmonies found in the hedgehog form. Sorry to double-up on artists, this is the last time we’ll do that. Monet’s “Hedgehog with a Parasol” (1874). This masterpiece of hedgehog impressionism is so well known it needs no description other than simple words like “painting,” “pretty,” “awesome,” and perhaps a few other descriptive terms you can come up with yourself. Okay, this one was in the book. But we’re throwing it out there, since it’s a Van Gogh, and we haven’t blogged about it, and it’s truly delightful to behold repeatedly. “The Starry Hedgehog Night” was a view painted from the east-facing window of his asylum room in 1888. The nurses noticed the various hedgehogs hidden in the painting and were concerned, so Vincent repainted the more well known version of the painting. Much could be said, though it’s better to just look at it. Remember when we said we wouldn’t double up on artists? We don’t either. Here we present Vincent Van Gogh’s 1889 self-portrait, painted in the sanitarium at a point when he mistakenly believed he was a hedgehog. 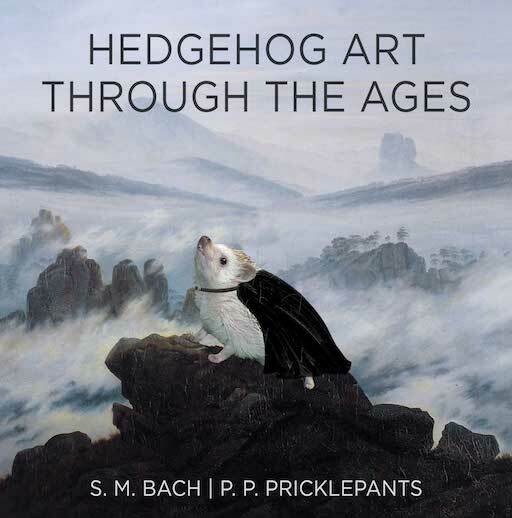 This work presents a fascinating view of the post-impressionist hedgehog art master. Finally, we present “Drawing Hedgehogs,” a lithograph by the Dutch artist M. C. Escher first printed in January 1948. 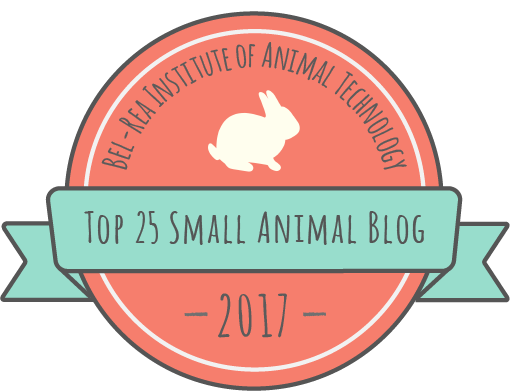 While there are copious words that could be expended on this work, we’re already well past the arbitrary 1000 word limit we set for blog posts, so we’ll leave it as an exercise to the reader to come up with a proper description. Thanks for reading, hope you enjoy these magnificent works as much as we do, and until next time, adieu. This entry was posted in Art, Blog, Hedgehog and tagged Art, art history, da vinci, dan brown, hedgehog, monet, van gogh. Bookmark the permalink.